Take a good diesel sedan and subtract two cylinders from its engine and what do you get? In the case of Mercedes-Benz' new E250 Bluetech (click the image to open a slideshow in a new window), you get a car that may have a tad less horsepower and torque than the outgoing model, but not enough less to make any substantive difference. Gotta love the onward march of technology! The entire E-Class is updated for 2015, with a new interior and exterior you won't mistake for anything but a Mercedes-Benz - and if you're a fan of the three pointed star that'll probably come as good news. It looks a bit less angular than the previous generation and is overall quite attractive and classy - as a Mercedes should be! It's even a bit sportier looking. The front end continues what appears to be a M-B penchant for moving the aforementioned tri-Star from the hood to the grille on some models, placing it where it makes the car look more aggressive but where it also can't be used as a "gunsight" to aim the car while you're driving (not that you'd do that, right?). And you can now get full LED "intelligent" headlights the maker says "match the intelligence behind the wheel." Of course, that may not be saying much! What they're actually referring to here has nothing to do with the driver, but rather is tech tweaks such as active curve illumination, which they say gives you better visibility in cornering, plus Adaptive Highbeam Assist, which takes the thought out of deciding when to raise/lower the lights on the highway, so you can still see and be seen without blinding other drivers. It's basically the next level of automatic headlights which, to me, are one of the most important safety features on the road today because they help prevent oafish drivers from tooling along with darkened tail lights in areas that mandate daytime running lights (another instance of the law of unintended consequences). The heart of the E 250 Bluetec is its new 2.1 liter, twin-turbo inline four cylinder diesel engine, which is quiet and clean and nicely torquey. Mercedes-Benz says it puts out 195 horsepower at 3,800 rpm, which doesn't sound like much - but as is diesels' wont, the story is in the torque - and the Benz power plant cranks out a lovely 369 ft.-lb. of the stuff, and makes it available from only 1,600 rpm. Needless to say, it pulls beautifully and actually does feel more like a six cylinder engine. Benz claims a 0-100 km/h time of 7.9 seconds for the E diesel, which won't peel back your eyelids, but which is plenty quick enough for a car like this. And if you want more, Mercedes-Benz would undoubtedly be thrilled to sell you the V-6 powered E 350 or a mighty AMG version. Besides torque, diesels are also about fuel economy, and the largish sedan gets a claimed mileage of 7.4/4.6 liters per 100 kilometers (city/highway), according to the manufacture. Fuel economy is enhanced by the now-common start/stop feature that shuts the engine down at red lights under certain conditions. It sure wasn't shutting the car down during my week with Mercedes-Benz Canada's sample E250 Bluetec, because it was bitterly cold and the car desperately wanted to keep itself and we occupants warm. We appreciated that, and it did a fine job - even though this particular version didn't offer rear seat heaters. The diesel is mated to a seven speed "7G-TRONIC PLUS" transmission that even offers a set of paddles and a decent "pretend manual" mode. Mercedes-Benz has tweak the transmission for 2014, offering a new "temporary manual mode" that's meant to "facilitate a dynamic driving style as well as to avoid inadvertently remaining in manual mode (especially after a manual downshift)." It works, but it's hardly unique: many other auto/manuals also revert to automatic mode after a while if you don't keep shifting it yourself. It's a handy feature. That manual mode, coupled with a relatively unobtrusive traction control system, meant the vehicle was great on our snowy streets, offering a serene and safe experience that was still entertaining enough when snowy parking lots came around. Mercedes' Canadian web site says all E diesels are 4MATIC, though there was no badging to indicate that. It sure felt like AWD in the snow, though, and we were also very happy with that. In fact, the car's cold weather performance overall was extremely good, except that the driver's side window tended to fog up badly in a very non-Mercedes-like manner, forcing us to leave the HVAC on front windshield defog more than we'd liked (because it took warm air away from us!). Still, the diesel started first time every time in cold weather, without complaint, even though it wasn't plugged in. Well, there was one really cold morning after it sat overnight when you could tell it would rather not be bothered ferrying around mere humans, but it started and drove us around just fine anyway. Of course it drives you around in Mercedes-like comfort, and how bad can that be? Take it out of its default "eco" mode via a button on the center stack and it becomes quite nice to drive as well; put it in sport mode and it gets quite lively, too. Very nice, indeed. Seats, as you'd expect, are very comfortable. There's room for three in the rear, though it was pretty tight when we stuffed a pregnant lady and two others - laden with cold weather clothing - back there. The driving experience is enhanced by a nice suspension that's tight (well, tight-ish; this is still a luxury car) without being jarring. It's described by M-B as a "DIRECT CONTROL Suspension," which will "reduce pitch and roll for a driving experience that is more comfortable and never less than thrilling." I have no idea what that means, but it's a pretty accurate take on how it feels, though perhaps "thrilling" is a tad hyperbolic. The sedan has good outward visibility and the controls and other stuff are all straightforward - more so than in past models. Mercedes' COMAND system (which consists partly of an analog radio tuner-like interface on the central LCD screen) works well and is easy to learn and use. And the company has joined the mainstream by moving its cruise control lever to where it won't be confused with the signal light stalk. Navigation is now standard (as is the Start/Stop) and there's also a new generation of Mercedes' Collision Prevention Assist and Attention Assist. The latter "continuously analyzes driving behavior and steering movements," and if the car's robot brain thinks you're in danger of nodding off it warns you via a "coffee cup" icon (accompanied by an audible signal) that appears in the instrument cluster. The Benz brigade says the system is now active at a wider speed range (from 60 - 200 km/h) with adjustable sensitivity "for drivers who already feel tired when they get behind the wheel." And here I had thought a little hand reached out of the steering wheel hub and slapped you awake again! Augmenting the system is a page in the instrument cluster display that shows your "current attention level, system status and driving time since last break." It also uses the navigation system to point out places nearby where you can pull over and get in a few winks, or at least a break. Mercedes' version of the Collision Prevention Assist beast is unobtrusive as long as the car doesn't see a threat. It monitors the situation continuously at speeds of between seven and 250 km/h and, as with most such systems, if it thinks something untoward is about to happen (such as you bearing down on another vehicle's rear end at what it considers an alarming speed), it hollers a visual and acoustic warning - and once you hit the binders (assuming you do), its Adaptive Brake Assist system calculates if you've hit them hard enough. If, in its never humble cybernetic opinion, you haven't, it can boost the brake pressure on your behalf. We didn't experience either situation during our week, so can't comment on how well the features work. I was tempted to try rear ending someone in the name of science, but my wife wouldn't let me. The base Benz Bluetec E starts at $57,800, which seems reasonable for a car in this class. Naturally, you can option it up the wazoo as well. The Premium Package adds a 360 degree camera, PARKTRONIC with Active Parking Assist, a heated steering wheel, media interface, rear window sunshade, and power trunk closer. The Sport Package ups the ante with an AMG styling package, sport brake system (with perforated front rotors and calipers that "sport" Mercedes-Benz logos, a black fabric roof liner and 18 inch twin-spoke wheels. According to M-B Canada's website, putting all the peripheral products onto the car will jack its price up to about $72,750, which is definitely nothing to sneeze at. But it adds a LOT of stuff, too, including a panoramic sunroof, upgraded audio and much, much more. 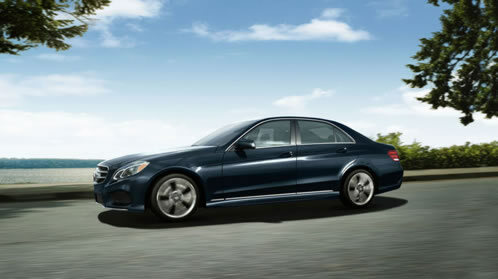 Other than the AMG's, which truly are outstanding beasts, this new E 250 Bluetec is probably my favorite E class to date. It drives very well, is luxurious and comfortable and, since it's a diesel, it won't break you at the pump (depending upon the price of diesel, of course). In all, a very nice sedan.